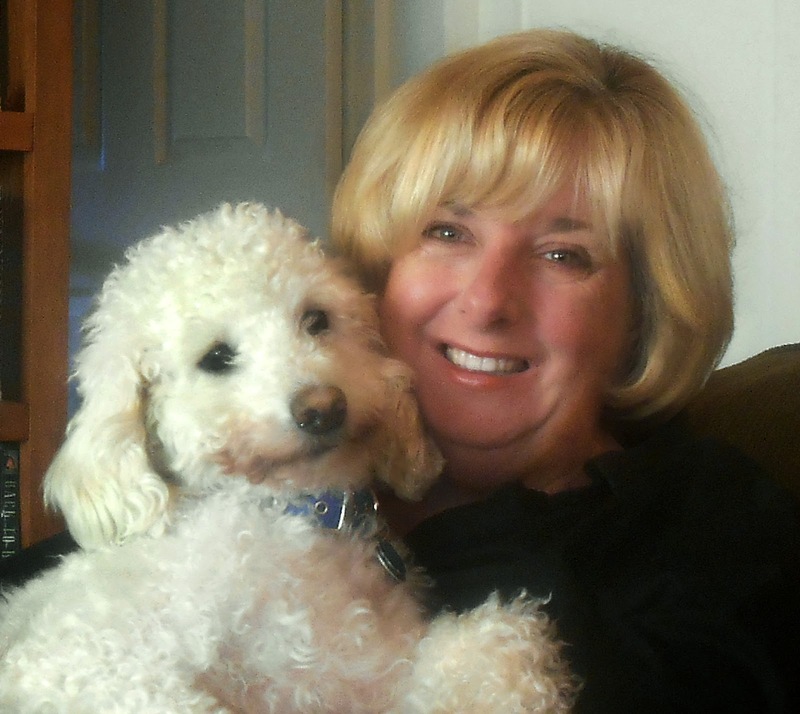 Today KidLit411 is excited to interview the very talented, Hazel Mitchell! Hazel is the illustrator of the upcoming AMANI'S MOON (October 2014) and TOBY (2016). Welcome, Hazel! Originally I'm from England. I was born in Scarborough, Yorkshire, which is a great seaside town on the North Sea. I spent most of my childhood riding horses, reading and creating stuff. It was inevitable that when I reached decision time at school I was torn between working with horses or going to art college. My art teacher won the day in the end. David Fulford was the best art teacher I ever had between the ages of 16 -18 (which is called sixth form in the UK, like senior high school here, except you usually study 3 subjects, Art, sculpture and English in my case). In the schools I attended in my younger days the art departments were not very inspiring. I usually just grabbed pencils, paint and brushes and got on with it. When I look back on those early days it was obvious that I was bound (one day) to illustrate, but, alas, I lost my way when I went art college. After 2 years and a year of that blowing glass (very badly), I drifted out of art college ... and back to horses. Eventually I decide I needed to do something with my life (and earn some money!). I joined the Royal Navy. It was six brilliant years! I was lucky enough to work in military graphic studios and learned many design skills, including working on the first computers. When I left the forces I set up a general print and design business, which I ran for eight years until I met my husband (who is American) and moved across the pond in 2000. Then came the BIG life change! What to do? I began painting again after many years, selling fine art and portraits. And wondering about how to get back to illustrating. The rise of the internet enabled me to get commercial illustration work, which I did solidly until about 2010. But I would think about children's books, about the stories I'd been brewing for years. I'd no idea how to go about breaking into the publishing industry. We lived in deepest South Carolina ... far from New York and publishers. I would wander into Barnes and Noble or go to the children's section of may library. I remember many times when I'd slink out, my confidence at a low ebb from looking at all those fantastic, wonderful books. I'd go back to my studio and return to the commercial jobs. At least I had work! Somehow I imagined that all illustrators of children's books were young, or had started young and attended great illustration colleges. I was so stuck in my mindset of graphic design I couldn't see anything else. I was, however, starting to illustrate for self publishing authors, now that print on demand was beginning to be prevalent. Although I cringe at some of those books, now, I realize I learned a lot. I started to understand how a book was put together, and to read children's books a whole lot more and pay attention to the design and pacing I also began to see that the skills I'd been gathering over so many years - design, computer skills an understand of print and layout, colour sense as well as drawing and painitng - these things were tools I could bring to children's illustration. Plus, I had a lifetime's experience of working to deadlines coupled with the discipline of working for myself and the need to be consistent in both my work and working habits. Inevitably, as so many of us in children's books do, I found my way to the door of the SCBWI. It's kind of like the Holy Grail, right? Suddenly all the information was at my fingertips. What to do, what to read, how to find publisher's names and addresses and, most importantly, places to meet like minded people and drink at the inspirational well. Basically it's like a children's illustration and writing crash course. After a couple of years of reading the Bulletin (which at first seems like a foreign language!) and reading kidlit blogs, I got myself along to the 2010 winter conference in New York (my first time in the Big Apple!). I had the worst portfolio in the world, but I had a mind blowing experience. Although nothing earth shattering happened that conference ... I wasn't discovered or got a book deal. But I did meet amazing people, listened to great speakers, sobbed at the wonderful work in the portfolio display (and was inspired!). And I realized, on the whole, that I wasn't too old! In fact, I was just right ... for me. The one thing that I began to understand is we all have our own path in this business and as long as you are following your heart - you are golden. And I made some friends who I know I will stay friends with till I drop off the planet. From there I embarked on an intense round of conference going, book reading and generally saturating myself in the world of children's illustration. I spent far more than I could afford, but I had the support of my husband all the way. I built a mailing list, got a decent on-line portfolio together and mailed out postcards - oh, and I read and drew every day. In Fall 2010 I got my first trade book illustration project from Free Spirit Publishing. Since then I've had steady work and I don't think there have been many months when I haven't been working on a contracted project! For me things have grown steadily. I didn't turn anything down at first, no matter how long the hours were I had to work. I did non-fiction, picture books, chapter books, magazine work. Mostly for smaller trade and indie publishers. In my 'down time' I continued to work on my own stories and dummies, getting rejected, learning all the time. I submitted to agents, but somehow never jelled with anyone. I learned it wasn't personal - maybe I was too like someone on their list, or my style didn't fit, or I just plain wasn't ready. So I continued to keep in contact with houses I was already working with and hope that my work would continue to grow and books come my way. So - here's where the turning point really happened for me and it's only very recently! 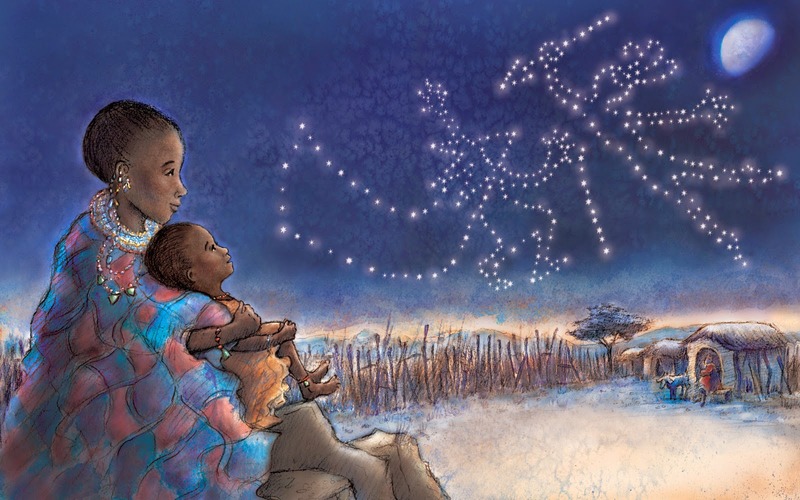 I recently illustrated several books in which I was able to see my style starting to develop 1,2,3 BY THE SEA for Kane-Miller, and ONE WORD PEARL and IMANI'S MOON from Charlesbridge. I was garnering some awards and getting on 'best of lists.' Somehow I could just FEEL that I was beginning to 'let go.' I can't explain it, but it is something to do with the joy of the story coming through! I'd been working more on my own stories at the same time, although they weren't quite submission-ready. I decided it was time to look for an agent again and see what happened. Well, Ginger Knowlton at Curtis Brown happened! A few years previously I'd been in a joint blog 'Pixel Shavings' and one of my fellow bloggers, (the brilliant Debbie Ohi), had mentioned Ginger had liked one of my illo's on a postcard we did as a joint mailer. I had never felt confident enough to submit to her, (because, like, CURTIS BROWN!! ), but suddenly I felt the time was right. I sent a snail mail submission to her. Ginger was kind enough to get back to me. She loved my illustrations, but wondered if I had anything written? You can bet I dove straight into my pile of dummies! 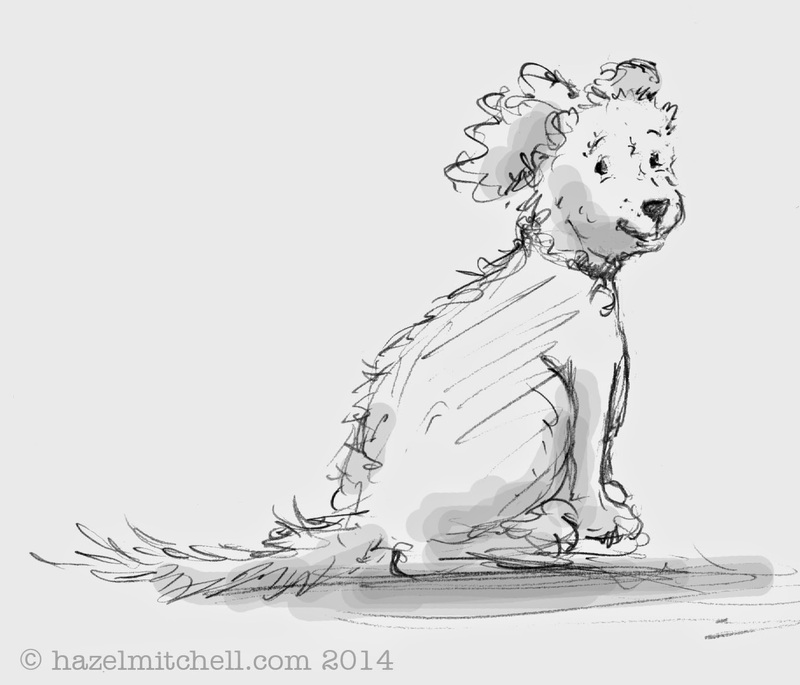 One idea I'd been toying with was a story that might feature my adopted poodle, Toby. Some of you may know him from Facebook, where he now has his own fan page! I had a 3 week hiatus while my current book was at proof, so I sat down and worked on the dummy for TOBY. I sent it to Ginger, trying not to hope too hard! (I have learned that a thick-skin is a good thing to develop over the years). To my utter delight Ginger emailed me that same day and said she would like to give Toby and me a go! Suddenly I had an agent! And one I knew I could work with long term. The fairy tale continued - my first choice of publishers was Candlewick. TOBY sat on exclusive with them for about 5 weeks, with conversations back and forth. I knew how long this could take. I tried to distract myself ... and then, just before labour day this year, Liz Bicknell made an offer and - finally - I can add author to the title of illustrator! TOBY will be published Fall 2016. Right now I am working on another PB dummy and a middle-grade mystery novel. It feels like my writing floodgates have opened! My latest book. 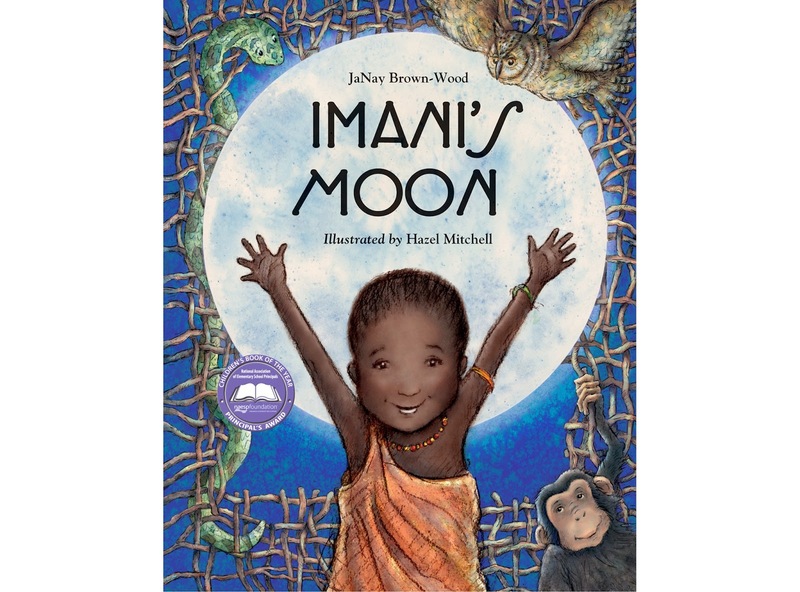 IMANI MOON by JaNay Brown-Wood from Charlesbridge, Fall 2014, is my favorite right now. It WAS challenging, It's the first child of colour I have illustrated. 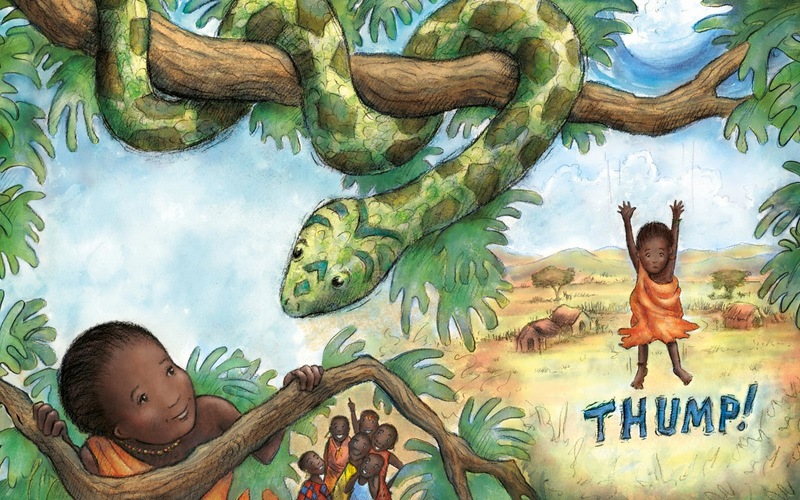 But it's a wonderful tale, with a feeling of a folk tale, set in a Maasai tribe. I was able to use a lot of watercolour techniques coupled with digital skills (honed over many years!) and there are even spreads in it I want to look at again and again! The story gave me lots of scope for experimentation. I love fantasy, and this has fantastical elements. The book will be published October 14, 2014. I don't think either is 'harder' and I like to do both. I think both ways of working bring different skills to the table. It's interesting interpreting another author's story. The clues are there, you have to see where they take you, what the mood of the book is, what kind of style will be right for it. I do work in different styles. And I am ok with that - and so far, thankfully, my publisher's have been too! I think it would be very boring to turn out the same kind of book time after time and frankly, I don't think I could do it. Maybe it is because of the many years I have spent in different careers, where often I was asked to work in a specific way - so when I get a manuscript, the words and story take me to where they want to go. However, now that I'm working on a book I have written, I think there is a looser, more personal way of working that wants to come through. The words and pictures are there at the same moment for the most part. So I am going with it! TOBY from Candlewick, Fall 2016. WHERE DO FAIRIES GO IN THE WINTER? from Down East, Fall 2015. Join the SCBWI. Go to conferences, or if that's not possible get all the information you can from the website, webinars etc. Network ... locally, online and social media. Read, read, read! The genre you are most interested in and then some others! Observe something closely every day. Keep an ideas file for stories. Join crit groups, mentor programmes, retreats. Be kind - remember it's not a competition, even though sometimes it feels like it and it's a small business. 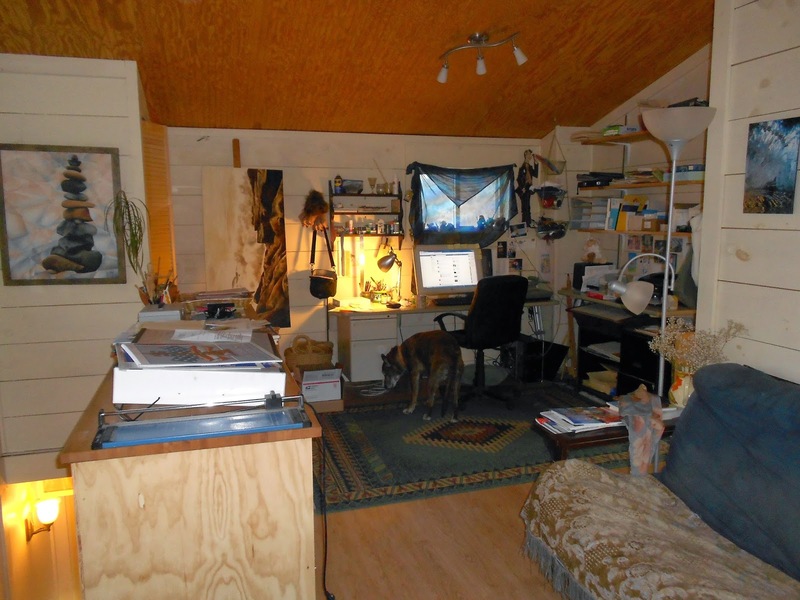 Hazel Mitchell lives in Maine, USA. Books she has illustrated for children include IMANI'S MOON, ONE WORD PEARL, 1,2,3 BY THE SEA and the ALL STAR CHEERLEADERS series by Anastasia Suen. Her books have been included in Bank Street Center for Children's Literature, Chicago Library and Charlotte Library 'best of' lists. Other awards include a gold medal from Foreword Reviews and bronze award from Society of Illustrator's of Los Angeles. Recent illustration projects include ANIMALLY by Lynn Sutton (Kane Miller) and WHERE DO FAIRIES GO IN THE WINTER? by Liza Gardner-Walsh from Down East Books. TOBY written and illustrated by Hazel Mitchell will be available from Candlewick Press in Fall 2016. This has to be one of the most inspiring interviews I've ever read! I've been feeling like I'm getting too old, having hit 50 this year, but Hazel's wise words have made me realize that it's never too late. Just reading "I had the worst portfolio in the world" made me smile and gave me hope that I, too, could make it (because I'm sure that if I presented a portfolio at the next SCBWI meeting, it will, also, be the "worst portfolio in the world." LOL!). I am in awe of Hazel's talent, amazing background, and pure enthusiasm! Thank you, Sylvia, and Elaine, for featuring her! Wow, thanks Teresa ... all you can do is tell it like it is ... our journeys are all different. Just do it! What a wonderful interview. Thanks for posting it. I LOVE the art work for Imani's Moon!!! Thanks so much Rosi, glad you enjoyed it. And I hope you enjoy Imani's Moon! wOnDeRfUl! You and Toby look adorable (and you really captured his spirit and look!). Congratulations on all the well-deserved success! Thanks so much, Toby had such character he is easy to draw! Thank you, Hazel, for sharing your experience. Do you know what I'm most grateful for? When you posted about the Nevada SCBWI mentorship program over a year ago. I applied and got in and completed the mentorship this past Spring, and it has truly been amazing and transformative. So thanks for helping me along on my illustration path! That's wonderful Sylvia ... I am glad. I got a lot of self confidence from the programme, not to mention lasting friends. Hugs! Great to hear your story, hazel, including your worries along the way. Thanks for the words of encouragement! What an inspiring account of your journey, Hazel. I'm so happy for you! Julie - it is amazing how we drift by each other unaware in the kidlit waters! Sylvia ... I am sure we did. Hurrah for SCWBI! I will be there this year, too! What an inspiring story! I appreciate how open and expressive you are. I look forward to seeing your new books. Toby looks precious, real and the illustrated :) Congratulations.